Way out to the West, in his jewel-splendoured evening boat, Ra had turned from a falcon to a ram, and become Atum. And the top of his ram horns had just gone below the horizon, as the reddened sun-disc he carried on them began the final part of its nightly descent into the Underworld. going past each other and slowing fast, as if she’d just come off a swing. She re-ordered the setting of the tables, just slightly. but it was beautiful. Then she sat in the arrangement and waited. and grasping the rope there was Repun Kamui. him up over the gunwale. At this, something in Repun started. Food was very important to him. there rained divinely tasty fish. “What’s wrong?” asked the whale-boy, as more splatted down. “Raw fish!” exclaimed Venus. “They’re slimy. They’re smooshy”. “Where I’m from”, he countered, “we call raw fish sushi”. said the looker, and went on, “God feasts need god cooks”. as if a great oven door had swung open at the stern. and started to fry up the feast. a raft made of barrels was knocking against the ship’s port. There was something missing from this party, they’d come! The gods of beer, and wine, and rum! Nin-kasi, and Yi-ti, who made wine from rices. and the gang of gods climbed them, up over the lip. – the god who bled wine. You may know him as Jesus. Then – since the drink had arrived – god after goddess arrived on the deck. A panoply of pantheons, set to get wrecked. But in the hold below there was a pirate gang. And their names were Prometheus, Bochica, En-men-dur-ana, Gwydion, Imhotep, Merlin and Sir Isaac Newton. magical marvels beyond any measure. And best of all, there was… a lighter. That, never mind crazy – the gods must be Tory! Now, with all the sea gods unwitting on the deck above, the gang made a hole in the side of the boat, and brought as much of the treasure and knowledge as they could manage up with them, to the raft made of barrels that the gods of beer and wine had arrived on, and stole away unseen. The Green Man stopped growing. And the love gods stopped kissing. And Prometheus’ pirate gang, on their barrel-raft, brought the treasures and the knowledge of the gods back to the mortal shore. And in the East, a bright disc rose, and it wasn’t Ra, or Helios, or Belinos any more – it was simply the Sun. Our Sun. The Sun in all its radiating, Helium glory. It wasn’t carried on a golden chariot or a bejewelled boat. It didn’t come out of a great charred hole in the ground. It was over a million times larger than the earth, and it was real. And for that, it was even more magnificent. And we still marvelled at it. And marvelled at all the things around us. Because with the gods gone, the time had come for the women and men of the Earth – to write our own stories. Linking us to Bards of old, may their spirit our words sustain. Of our flickering fire great heroes with glory to their names. With fiery ingenuity our future to manage. We stride like giants this earth our mighty footprint lies on. The titanic struggle between the best of man and worst. Whose tricks on the gods landed him in quandary. Legend says that twice he gifted us with fire. From burning particles which like us feed on air. We stared in cave or camp at white, yellow, orange, red. The flame bit our brains, like visions, like horses in the head. Human inventiveness and a world of ideas were set in train. His tracks he left by wheel and forge, the metal and the mine. Of Iron John who feared his own tenderness, you might say. The commons stolen from under us and work sent to hell. Into the maw of commerce we were pitched by Mammon’s hand. The glamour of such alchemy is a spell that didn’t shatter. Bronze age, Iron age, through to Nuclear age, heart of this rhyme. For whereto has it brought us, this civilisation? Seems to have a shadow around it cankerously curled. To what ends have these been twisted, sating artificial need? Humankind’s bright, bold abilities made void by yawning greed. Power-hungry leaders, of economies and armies flick the switches. Under concrete, under shelling, the seed of hope scarce twitches. We consumers flick switches too, on battalions of gadgets arrayed. Only the technological fix can ease our woes. Natural, renewable, self-sufficient, small-scale? None of those. And here in Somerset, Hinkley Point’s the way to doom. By the holy carrot of jobs we’re driven its miasma to consume. Letters which brand us like cattle and fence us in with electricity. Sold off and then subsidised, guess who foots the bill for so-called profitability. They say, ‘We’re all about low carbon, we make the world cleaner and greener. Sweeteners and backhanders, energy bosses at the government table. Consultation’s for the birds, their PR twitter a new Tower of Babel. Sucking crumbs from corporate finger, as subcontractors aim to make a killing. While Ukippers winge about windfarms, the nuclear behemoth circles our boat. And Hinkley buzzes and blazes like some nightmare carnival float. Splitting, rearranging, rewriting nature’s old wise tricks. Laying waste docile populus, sick from vaccination. To keep the lights on in Britain, have we put out our own? To blight our grandchildren’s lives with dangers well-known. Our faith is in Atomic Rod, not Church or Earth, intuition, spirit divine. On flat-screen TV, The Blue Planet HD. Gone Fission says the sign. Against nature we have bent our wits, oh! hubris improper. Did even Pandora imagine what we might un-stopper? Can the nuclear genie be put back in the steel and concrete jar? Human paradigms remade, earthly paradise regained, by seeing far? Corporations and their scientists life’s divinity blaspheme. Economic necessity the wheel on which they break our dream. But not even the gods saw the anti-worlds within the reactor. Forces beyond our control, as thunder is heard to mutter. Five miles down, they carve hell’s chamber and death in there they shutter. Human folly punched in deep by iron fist to her core. A fog of lies they spew, media mockery they orchestrate. 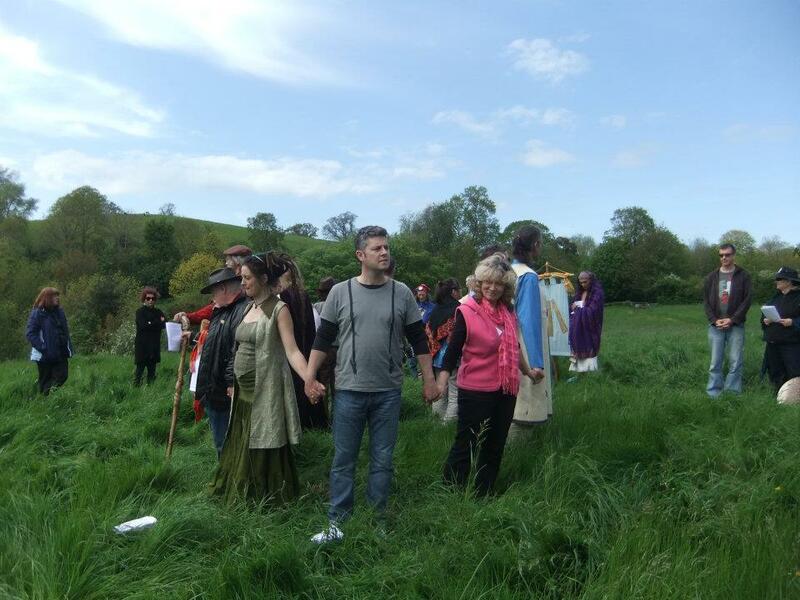 We’re naysayers, nimbys, tree-huggers, we hold hands, sing and demonstrate. They say we want the world dragged back to primeval dark and mud. A task greater than that of our champion and fire-stealing friend. 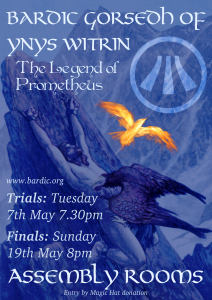 Prometheus, you’ve been dishonoured by the race who won your trust. Elemental you made us, out of sparks and rain and dust. We are the stuff of cosmos and the heroes of the hour! We shall stand tall and not before presumed consensus cower. No man is god for all his power, that’s the moral of this tale. Let’s remember our maker’s gentle hands, who loved us human-scale. Flesh of clay, soul of fire, our perfection he built in. Scientific improvement not required, just to see the light within. And sweet energy, of natural source, speak not death but birth. and that’s my passionate muse and my deepest desire. I teach and share, to break down limitations. I lay myself bare – In Truth – Inciting transformation. and I make no claims on this flame I hold. Burns at White Spring, cavernous, within this sacred land. And I nurture yet another flame, smouldering ember in my heart. Breath of muse ignites a blaze, to stand me here playing the bard. 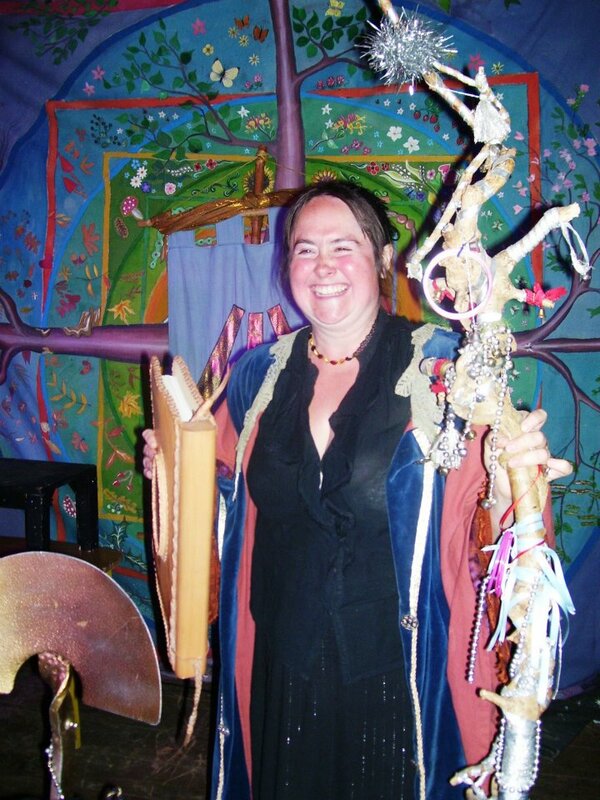 and when I check in with the Awen – I find something to impart. Shaping man after might, in name of his love. Athena was consigned, to breathe life; mortality. Human being was defined, but what of personality? and Prometheus observes this rift. but we were snubbed in favour of his plan. So Prometheus stood us up and the resistance began. He felt his love for humans like fire in his brain. And under no delusion he nurtured tender flame. To bring it to his people to rise against their pain. And a way to keep all of us warm in wind and rain. and with only bones to pick, Zeus took fire, left us dust. with treachery vociferous he lit a torch from the sun. Imagine the aurora! Yes! Zeus was set to stun. He sent pretty Pandora, deceptive heart and lying tongue. Athena, Epimetheus, Prometheus and us. Pandora’s curiosity, was bound to do us in. Her apparent generosity was not to be boxed in. And she unleashed an atrocity of suffering and sin. and all manner of monstrosity to get under our skin. so we could be capable, to cope. of a woman unobtainable who revealed the boxes scope. He was seized by Gods unshakable, chained on Caucasian Jail. Prometheus never repented, Liver heal and liver bleed! Yet Prometheus never lamented, it’s greed. And a mortal so sincere to destroy the daily threat. The trickster may find asylum with God’s such as these. 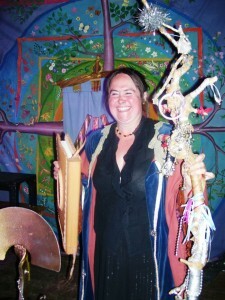 wounded healer and defender died with notoriety. 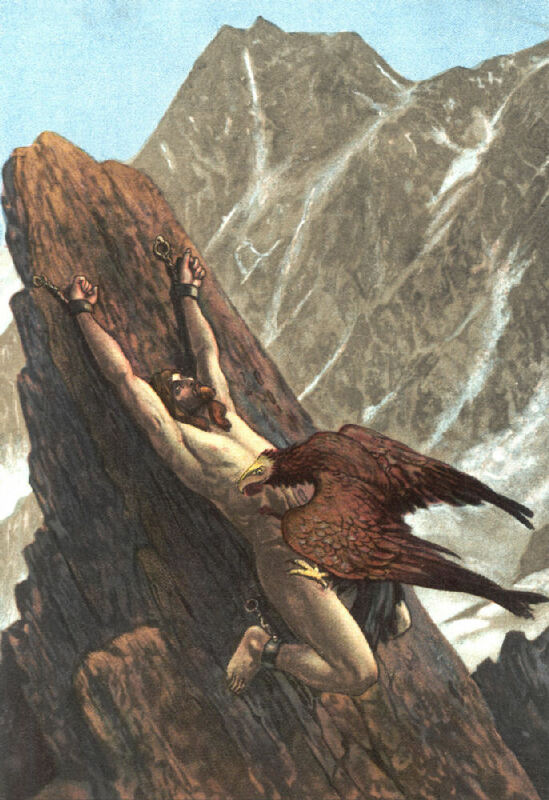 And unchained poor Prometheus … at least that’s what I heard. When I met him on the bus! Still, I took the chance to ask him, why Prometheus? I bring you Fire! I offer Power! Bring you liberation, to create or to devour. I Titanic traitor chained unto a stone. Bird satiater, cursed to live and die alone. permanently scarred, and on what charge? My unrepentant, holy burning heart. Bound in chains, my Olympic fall from grace. Each day an eagle’s feast, my sacrifice to warm your face. and a million clay built humans still shun the sacred fire. You heard me! I gave up what I got! I suffered and I sacrificed, for what?! tormented by Pandora, holding false hope’s privilege. Orange coiling filaments, light switches. Flame dis-owned! And you choke in the smoke of your ill fed bonfires. Eyes burning acrid; blinded by fools and liars. You stand me in eternal golden form, beside your temple to Mammon. To witness your torture again and again. New World Order bound, coca-cola reign on your parade! An Olympic spell with one to rule them all, one to pretend. A million eyes gaze on the screen, open to suggestion. ‘Go back to sleep,’ they say. No need to beg the question. All you vacant vestal virgins wear about your neck, false chains. And my deluded clay creations. You know nothing of my pains. Or do I judge too quick? Will you awaken from the eternal torture of your soul? Will you break the chains that bind you before your liver is sold? Will you tend a sacred flame? Will you keep it pure and clear? Take the power of my prophecy to those who would hear! Will you light a simple fire, to sit by with your friends? Will you grasp your sovereignty? You have a planet to mend. Do you dare to burn and sack your Gods of corporation? Do you care to claim back? Reinstate your sovereign nation! I leave with you my history. 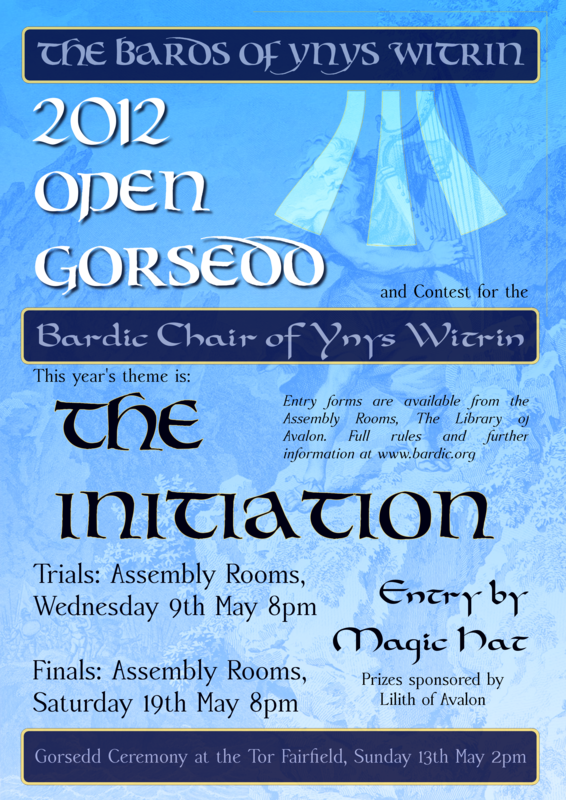 This year’s contest for the Bardic Chair of Ynys Witrin was won by Lisa Goodwin. The crown was awarded jointly to Harmony Davies and Hugh le Provost; Richard Field won the fool’s prize for the second year running and the Tim Sebastion Memorial Trophy was awarded posthumously to Graham Coles. The standard of entries was higher than ever and the atmosphere for the Finals was electric. 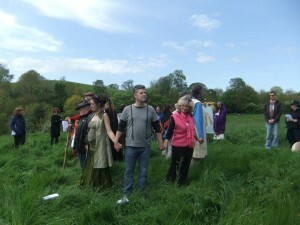 We had a gorgeous Gorsedh ceremony on Sunday afternoon – the weather held off ominously overhead. It is with great sadness we remember the passing this year of Graham Coles, Glastonbury’s Town Crier and Honorary Bard and Nikki Dorakis, who provided valuable magical support in the initial setting up of the Gorsedh. Gerry performed her duties admirably, initiating seven new Bards and graduating to Elder herself. We would like to welcome Thalia Brown – *Lady of Avalon, Senga Skylark, Duncan Batey, Steve Astronaut, Lisa Goodwin, Jeremy Bull and Hugh le Provost as new members of the college. 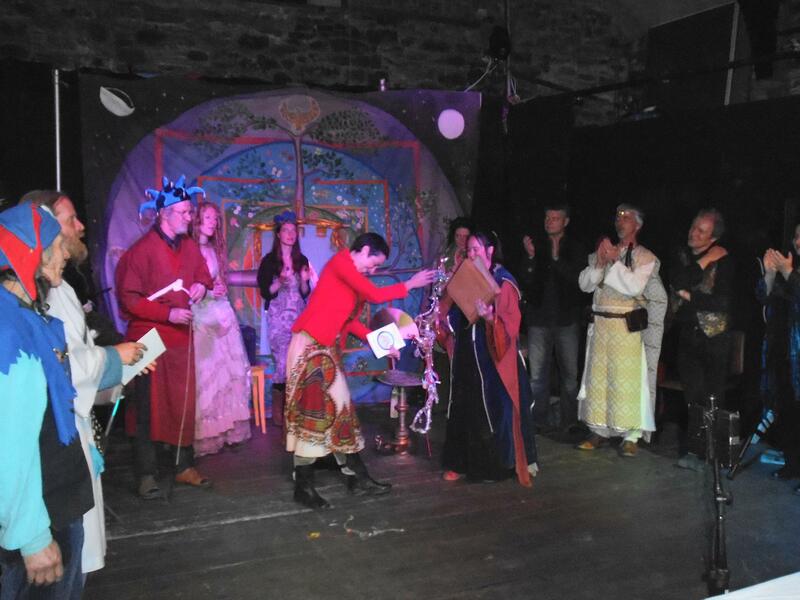 It was lovely to have the Mayor attending this year and it was a profoundly moving experience to welcome Geoffrey Ashe as an Honorary Bard. I shall treasure the look on his face for years to come! Thanks to Lydia Lyte (Swordbearer), Denise Michell (Elder Druid) and Shamus Joy (Herald) for holding the energy of the ceremony so gracefully. It was great to be able to chill out at the Buddleia Bar afterwards and ground the energy with some mouth-watering cheesecake! Of how they carry on…? The secret of Mister Toad…? She’s at his every whim…? Right here, by my side. Since Mister Toad hopped away. For you, and for I. Left me for a moment without. Before it reached Heaven above. Seems no sense at all. Feels no sense at all. Of Nocturne’s fallen Darkling Prince. A Tower for to build. And cast your eyes not down. Gaze thee ‘pon a tragic, benighted fool. And see him very well. To espy, whereupon he coulds’t fathom. ’til he chanced on the Uppermost Lathom. Pray what is the secret of greatness…? “Sliced bread, and a penchant for lateness“. I’ll eat bread and be known for me lateness“. And the Trollimoste kept to his vigil. Though he dids’t meets a Trollimoste-Girgil. ’til he chanced upon said Lathom. But you took silly words at face value“. And the moral to this sordiest tale…? Don’t be like the Trollimoste-Gumbell. 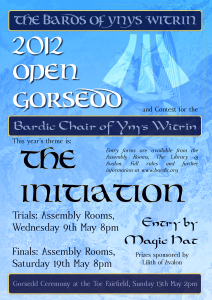 We’re thrilled to announce that Gerry Barnett won the 2012 contest for the Bardic Chair to become the 7th Bard of Ynys Witrin. The Crown went to Harmony and the Fool’s Hat was presented to Richard Field. The Judges decided to award the Tim Sebastion Memorial Trophy to Nathan Lewis Williams for his work in “the elevation of the word” and Tara was accepted as Younger Bard of Ynys Witrin for 2012. 10 new Bards were initiated at the Open Gorsedh ceremony, so we welcome Richard Field, Denise Michell, Gerry Barnett, Lokabandu, Carol, Stuart Packer, Morag of he Moor, David Muir, Andy and Daygan into the fold. Honorary Bardships were also awarded to Pok and Graham Coles (The Town Crier of Glastonbury) in recognition of their unique contributions to the community. With 14 contenders in the Trials, this was the biggest contest we’ve held so far and the standard of the entries was phenomenal. Thank you to everyone who took part and contributed to making it happen!